The molecules of this type CH₄, CCl₄, PtCl₄ are the examples of having zero dipole moment. This suggests that they are either regular tetrahedral or square planer. But polar molecules of this type have pyramidal structures. 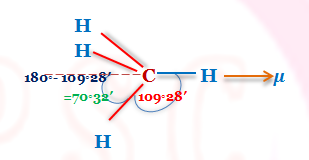 Let us discuss the structure of CH₄ that have regular tetrahedral structure and the angle of each H-C-H is 109°28ˊ. The electric moment associated with a group is called group moment and it depends on the arrangement of the bonds in the group and the difference of the electronegativity of the constituent atoms forming the bonds in the group. 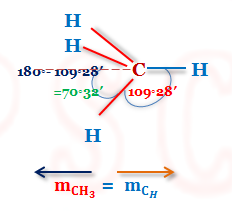 It can be shown that the group moment of CH₃ (mCH₃) is identical with the bond moment of C-H (mC-H) and so the two moments cancel each other resulting zero dipole moment of the molecule in CH₄. This idea explains the same value of μ for CH₃Cl and CHCl₃. Similar calculation can done for the group moment of C₂H₄, C₃H₇, C₄H₉ etc. have the same vale and equal to the bond moment of C-H. The identical value of dipole moment of the homologous alcohols and saturated hydrocarbons confirms the above statement. 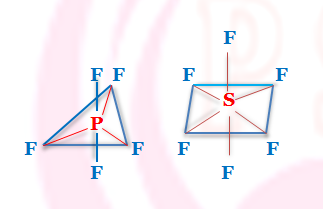 The molecules of this type are PCl₅, AsCl₅, PF₅ etc have μ =0 indicating that they have pyramidal structure having center of symmetry. Hepta-atomic molecules like SF₆, XeF₆, WF₆ etc have μ =0 indicating that these have octahedral symmetrical structure. 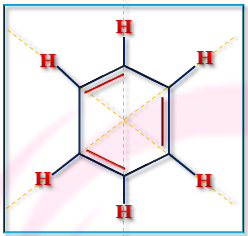 Zero dipole moment of the benzene suggested that it has regular hexagonal planer structure and it confirms Kekule’s form. However, if hydrogen atom is substituted by another atom or group, it acquire polar character. Examples of such derivative of benzene are C₆H₅Cl, C₆H₅NO₂, C₆H₅OH etc. When di-substituted benzene are considered it can be shown that o-isomer will have highest value of dipole moment then other two isomers. p-derivative has lowest value while m-derivative has the value between two. provided the group must also be lie on the same plane of the benzene ring. (this has been confirmed for C₆H₄Cl₂ and C₆H₄(NO₂)₂. This determination of dipole moment helps to determine the orientation of the groups in the benzene ring. p - dinitro benzene has μ = 0 but p - dihydroxy benzene μ ≠ 0. Explain. Through the p-dinitro benzene has μ = 0. p-dihydroxy benzene has dipole moment(μ ≠ 0). This is due to the fact that the two substituted hydroxy group are not on the same plane of the benzene ring but are inclined to the ring. Presence of double bond in C - C link restricts the free rotation and geometrical isomerism develops. 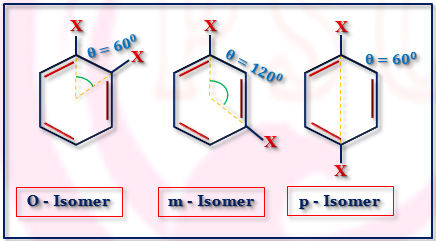 The Measurement of dipole moment helps to distinguish the two forms of geometrical isomers. 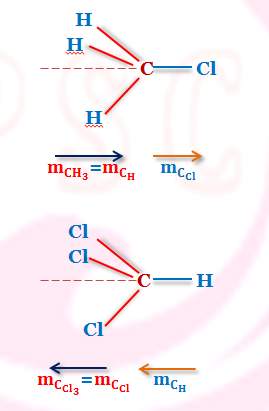 For molecule CH₂Cl - CH₂Cl, several conformations are also changed and so dipole moment (μ) of the molecule is also changed. The dipole moment of o-xylene = 0.693 D. Find the dipole moment of toluene. Again θ = 120° for toluene and dipole moment(μ) of toluene = m.
Thus the dipole moment of toluene is 0.4 D.
How to Calculate Dipole Moment of a Compound ? (i) For Penta-atomic Molecules(AX₄), (ii) Hepta-Atomic Molecules( AX₅), (iii) Benzene and its Derivatives.